The story of our garden began 21 years ago. 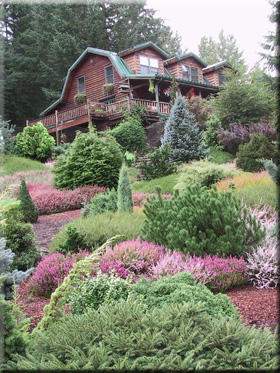 Before then, our log home had been an island sitting in a sea of bracken fern and blackberry vines. For ages, though, we had dreamed of overflowing window boxes and colorful flowerbeds surrounding the house. We'd even set aside large numbers of trees and shrubs in the nursery for our future landscape. Every year the plants grew larger, and each spring we moved them into bigger pots. There was never time for gardening. The nursery was growing and we were too busy. Then one October morning in 1995 we got a call from the president of our local Hardy Plant Society. They were having a large conference the following summer. Would we like to open our garden for a tour at that time? (She assumed we had a nursery display garden) The attendees were coming from all over the United States, she told us, as well as England and Canada. We were offered free admission to all the lectures, plus meals. Naturally, we said yes. Then the president asked for one more thing — a written description of our garden to put in the conference brochure. We told her we would fax it to her the next day. Later that evening we stood at the living room window and scrutinized the jungle outside. Then we wrote a glowing depiction of our mythical garden. We described terraces bursting with magnolias, rhododendrons, azaleas and Japanese maples. Rare plants cascaded over moss-covered stone walls, and mingling vines climbed up arbors. Ferns, hostas and astilbes filled secret shady places, we wrote on. A slope of heathers and dwarf conifers descended toward a small creek which, in turn, splashed over tiny waterfalls as it made its way to a waiting pond below. There were blooming masses of roses, herbs and perennials, and a woodland walk meandered through the adjacent forest. It sounded great in writing, but could we work its creation into our busy schedule? No problem. After all, we had eight months! We began clearing the land the next morning. As the days passed , we hauled in topsoil, compost, horse manure, sand, bark and anything else organic we could get out hands on. We drew up a rough landscape plan and installed irrigation pipe. Obtaining material for the stone retaining wall was easy. Everywhere we put a shovel in the ground we found rocks. Big rocks. We figured we could build the wall in couple weekends. Three months later the last stone fell into place. By now it was well into winter. We promised ourselves we would start planting every day, rain or shine. And we did. But the months passed quickly, and with a mere two weeks remaining, we still had a long way to go. It was time to call out the reserves. Family, friends, neighbors, employees and unwitting passers-by were enlisted. We laid sod, planted trees and shrubs, spread compost in the flowerbeds, lined the creek with river rock and barked the paths. Our employee, Sylvia, created the woodland walk in an amazing three days. (She used to build mountain trails for the U.S. Department of Forestry.) It was 102 degrees the day before the tour, and still the faithful volunteers worked on. Finally, the morning of the big day dawned, and we stood, again, inside the house looking out the living room window. There it was...our mythical garden. The terraces were planted, roses and perennials were in full bloom and an agreeable clematis had made it to the top of the arbor. A weathered wooden bench posed an invitation to rest in the shade amongst the ferns. The stone wall was there and it even had a little moss growing on it. An inviting path disappeared into the forest, and Mark's newly finished steps descended through a hillside of heather towards our little creek, now burbling happily towards the pond. The conference attendees began to arrive several hours later. They thanked us for letting them come. They remarked we must have worked for years to create such a spot. Did we tell them about our frantic groundbreaking activities during the previous eight months? Did we speak of the mud, the broken tools and the killer blackberry vines? Did we mention the blisters, cuts and bruises, pulled muscles, frostbitten noses and lack of sleep? And did we reveal what had been going on the previous day? Of course not! We simply smiled and welcomed them into our garden.